He wasn’t there, he wasn’t mentioned by name, but he was undoubtedly the elephant in the studio. It’s a fair bet that the words “Donald Trump” and the US president’s face did spring to the minds of many a radio listener, when an interview his predecessor gave to Britain’s Prince Harry was broadcast on Wednesday. Barack Obama warned of the dangers of the internet and new technology in the modern era and highlighted the responsibility of leaders, in the interview for BBC Radio 4’s Today programme which was recorded in September. The British royal mentioned “trolling, extremism, fake news and cyberbullying” on social media and asked the former president whether he could have done “more to get ahead” of such issues. Obama referred to the challenge of harnessing new technology to allow a diversity of views aimed at finding common ground, without leading to a “Balkanisation of our society” - a geopolitical term also used to describe other forms of fragmentation. “All of us in leadership have to find ways in which we can recreate a common space on the internet. One of the dangers of the internet is that people can have entirely different realities, they can be just coccooned in information that reinforces their current biases,” the former president said. “The truth is that on the internet everything is simplified, and when you meet people face to face it turns out they’re complicated. And you find areas of common ground because you see that things aren’t as simple as had been portrayed in whatever chat room you’ve been in. It’s also by the way harder to be as obnoxious and cruel in person as people can be anonymously on the internet,” he went on. Obama has previously warned that social media can lead to snap judgments being made about complex decisions but has refrained from criticising his successor, who is an avid user of Twitter. 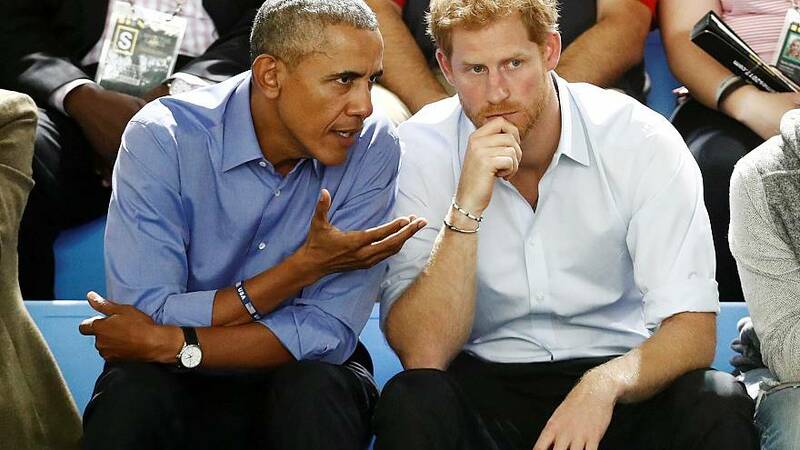 Donald Trump’s name was absent again when Prince Harry asked Obama how he felt on the day his successor was inaugurated in January. The ex-occupant of the White House paid tribute to his wife Michelle and his daughters, saying he felt a satisfying sense of “completion” and “integrity” at work that had been done. “That was mixed with all the work that was still undone and concerns about how the country moves forward. But overall there was a serenity there, more than I would have expected,” Obama added. Appearing live on air after the interview was broadcast, Harry was asked whether he would invite the Obamas to his wedding next year with US actress Meghan Markle. The prince is said to have become good friends with the couple and admitted that fixing the interview had been easy. However, some reports have hinted at potential diplomatic trouble between the UK and the US if Barack Obama is invited to the wedding in May – and Donald Trump isn’t. In the BBC interview, the former president spoke of being able to take a longer-term view on issues such as climate change – citing hurricanes that had devastated southern US states and Puerto Rico. “Today those aren’t my direct responsibilities but I can focus over the next 20 years in making sure that we don’t have more hurricanes and natural disasters that are accelerated as a consequence of climate change and the ability to focus long term I think is a great luxury,” he said.